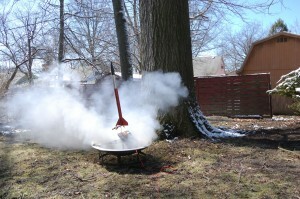 Static ground tests of the Artemis Booster were successful. After a one day delay due to a short blast of winter weather, we managed to perform the static ground tests of the Artemis booster under rocket power. The purpose of the tests was to test the ejection baffle system to ensure proper operation. Two tests were performed under close full power using E-9 rocket motors. This would test the baffle system under close to the most strenuous motor that will be used in the booster. 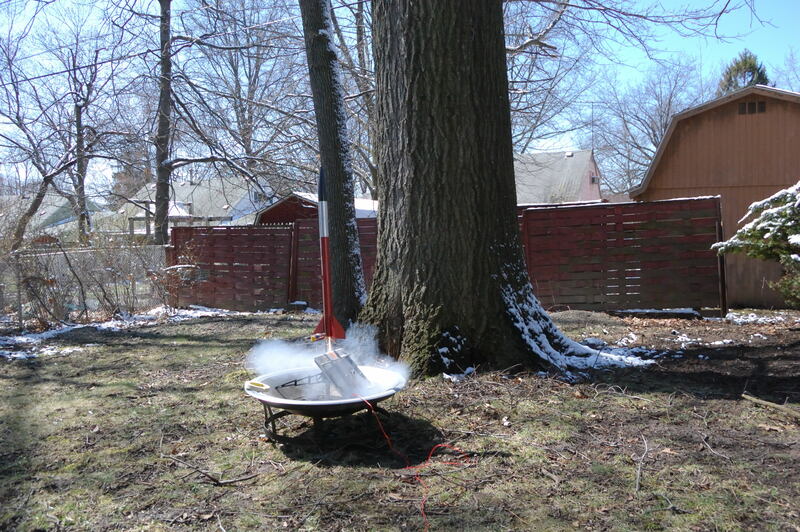 The ejection system performed flawlessly during both tests, clearing the Artemis for its first flight tests Saturday, March 27th. A low-cost plastic parachute was used to ensure that no hot particles made their way into the (silver) parachute bay. If so, the parachute would instantly melt under the heat. The parachute survived in “good as new” condition after the test. 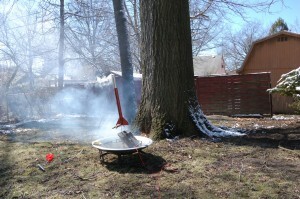 Test #2 completed, and the orange parachute is deployed. Another purpose of the test was to ensure our customized built-in baffle system would survive being bathed in hot gasses and molten particles of the black powder ejection charge. The system survived the ordeal. 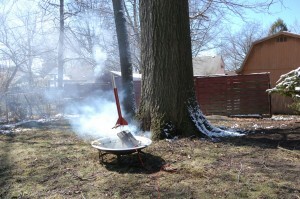 Tests conclude the system is good for two consecutive flights – after that, cleaning and replacement of the aluminum heat shield material is required before additional flights can be performed. We are looking into high temperature epoxies to coat the outer baffle walls to eliminate this restriction on future flights. The inner baffle appears to be in really good condition. 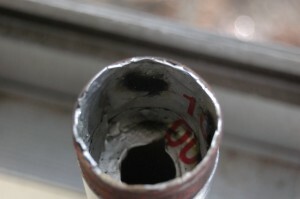 The inner baffle showing the dark patches where the hot gasses were deflected by the outer wall. Inner baffle post-test. 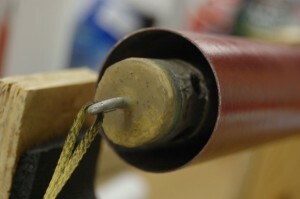 Kevlar rope shows some carbon residue from the ejection charge. Our next report will be after tomorrow’s (Saturday) maiden flight! The Artemis Booster was just completed today, clearing the way for the first Artemis flight trials Saturday, March 27th at the Harmon Flying Field in Aurora, OH. The Artemis booster is designed as a mid power launch vehicle, and if successful, will be the first to fly active payloads 1000 – 1600 feet in the air. Most will be electronic in nature, recording aerodynamic force data to be used for the development of the Carina Shuttle project – projected for sometime in 2012. 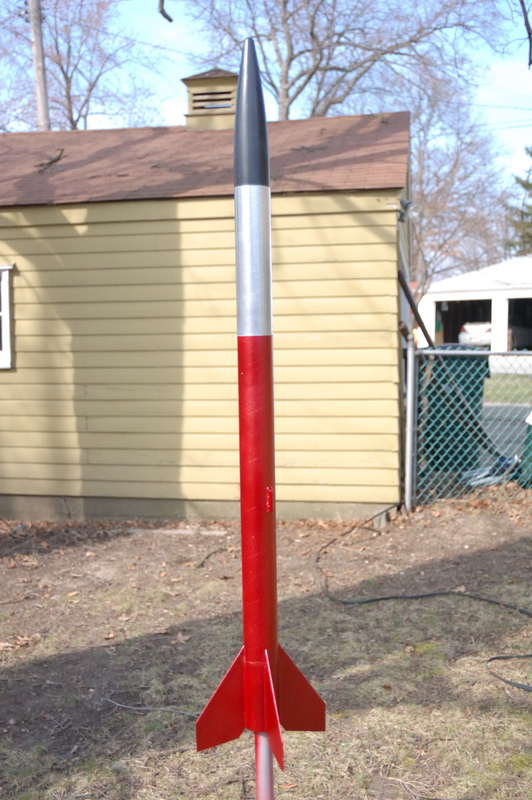 Artemis Booster ready for its first flight trials. Other payloads to fly on the booster will include a camera for ariel photography and payloads for the development of radio telemetry gear slated for use in the Carina shuttle project also. For the first 4 test flights, the Artemis booster will be in it’s “1A / Short configuration” with a nose cone section attached at the parachute bay. The March 27th launch schedule will include two low altitude test flights (below 800 Ft.), and depending on the outcome of those test flights (and weather conditions) , the launch schedule will conclude with a flight to an altitude of 900 ft. Besides lofting electronic payloads into the air, the Artemis booster is testing some technical features that may be included in the upcoming Sagitta heavy lift booster. 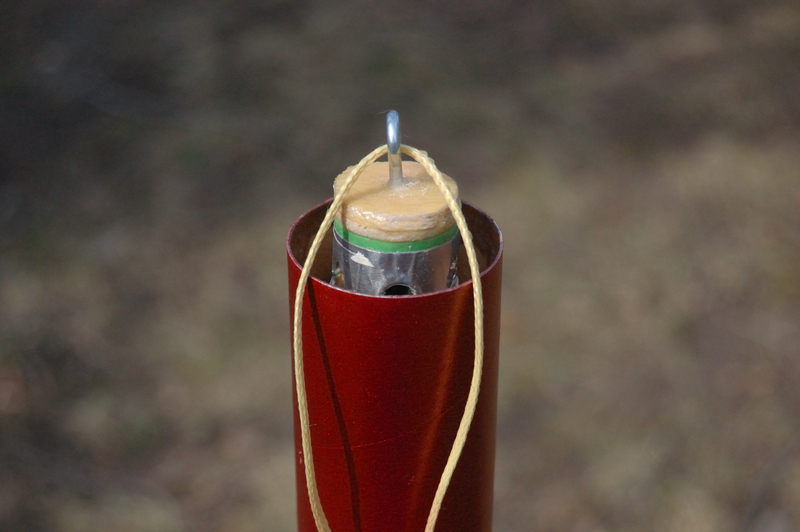 Among the items being tested are a built-in two stage ejection baffle system designed to cool the hot gasses created by the black powder ejection charge during parachute deployment. Inner portion of the Artemis Booster ejection baffle. There is a parachute bay on the Artemis Booster, which is the section of the airframe painted silver. This section of the airframe is removable, and exposes the inner baffle. 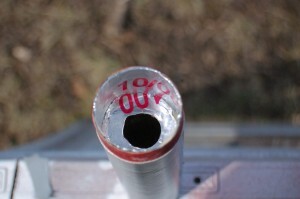 The bottom half of the silver parachute bay comprises the outer baffle section. The Artemis booster carries forward design tech features of the Aquila Booster, which gives the ability to fly upper sections of various sizes and shapes depending on the task at hand. One upper section design increases the overall height of the launch system to over twice its current test-flight configuration height. This configuration will be named Artemis V, and will greatly resemble the Aquila 1C configuration we’ve been flying over the past few months. One main advantage of the Artemis Booster will be the ability to launch to specific altitudes and carry loads of various weights by using a range of black powder or composite engines to suit the task at hand. 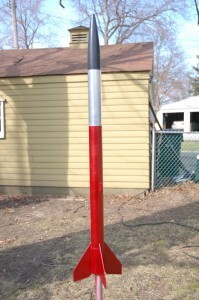 The Aquila Booster, on the other hand, is limited to only light-weight payloads to be launched to an altitude of approx 1200 – 1300 feet. The Aquila launch vehicle has no provisions to compensate for heavier payloads or for flying lighter ones at lower altitudes. Our next project update will be after the first test flights from the Harmon Flying field March 27th!